Who from our group is going to Hethel? Yes the one at Fen Ditton but that was several years ago and I don't think there are any meets in Cambridge at the moment. I will try to get to Norfolk in the not too distant future. Didn't see you unfortunately. I live in Milton, Cambridge. During my holiday on South Miami Beach last week I was pleasantly surprised to see this Evora 400 parked across the road from my hotel. It was generating much interest and lots of people were stopping to take photographs. 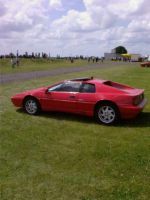 Gold S2 Esprit Ex Factory Show Car Recommissioning. Just seen it. Looks amazing!